Stairways, Inc. offers two basic rail configurations: 1) Spiral stair railing using vertical balusters or, as shown, 2) horizontal pipe railing or line rail. This contemporary spiral stair uses a 7 line system with less than 4" spacing. Spiral stair diameter is 72" with a 30 degree tread run. The spiral stair treads are a custom arc pattern made out of a heavy duty 3/16" thick carbon steel. The top spiral stair rail is a 1 1/2" round tubing; the other intermediate rails were made from 3/4" solid round bar. The posts, at every quarter turn, are made from 1/2" x 2" solid flat bar. The center column is made out of a heavy duty 6" ID schedule 40 pipe. The spiral stair finish is a hot dip galvanized coating. Application - exterior coastal environment: tough conditions for any steel product. Galvanizing is a tried and true solution to this condition. 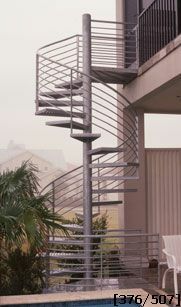 Fully assembled spiral stairs (FAS) from Stairways, Inc. are fabricated completely at our plant in Houston, Texas, shipped to our galvanization supplier, and dipped in one section. Coated inside and out makes these spiral stairs tough in all conditions.